Mike Marino was one of the most beloved Professional Wrestlers to ever to put on a pair of wrestling boots, he was loved in equal measure by both the fans and the wrestlers alike. Never without a smile on his face i cannot remember ever seeing Mike in a bad mood. During the hey days of British Wrestling most wrestlers would travel in excess of 1,000 miles a week and if you were fortunate enough to be travelling with Mike Marino then you knew you were in for a treat. You'd be laughing all week, as Mike was able to tell jokes and play pranks from Lands end to John O'Groats. His love affair with Wrestling was second to none and Mike was most happy when he was wrestling around the halls of Britain and passing on his seemingly endless knowledge to his trainees. He was never happier then when he was teaching young hopefuls his trade. Many of these young hopefuls going on to be main event stars and champions in their own right. In the glory days of wrestling any promoter in the land that knew you were one of Mike Marino's boys would book you sight unseen, simply on the reputation and respect that this great man had earned from his years in the sport. He was so good that he was know as Mr Wrestling by the fans, promoters and wrestlers. I ( Wayne bridges), was fortunate to have had the pleasure of knowing Mike personally for over 30 years and I can never remember a time when he wasn't top of the bill. Another loved and respected man in the business, was Mike's cousin Joe D'Orazio, who can remember Mike being top of the Bill in the 1940's! 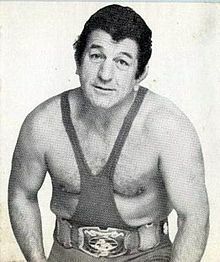 In that era the man to beat was Bert Assirati, one of the toughest and hardest men ever in wrestling. The blood bath matches that these two greats had at that time are still talked about to this day at the Reunion by some of the old timers. As are the classic matches he had with Judo Al Hayes amongst others, these matches will go down in the history books as being some of the most technically proficient and scientific displays of wrestling of all time. The sad passing of Mike Marino occured on the 24th August 1981,following a seizure, while he was travelling home on the M20 from a show when he choked to death having swallowed his tongue, in the presence of some of his boys including Mal Sanders and Mel Stuart . He had been admitted to Ashford hospital with a swollen tongue but discharged in the company of Sanders but it was later confirmed that he had been suffering from Leukaemia. It was a sad sad occasion for all.